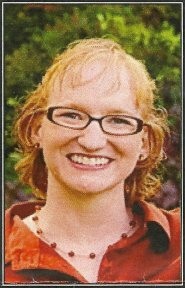 Lorajean Elizabeth Vrieze Spencer, 33, of Rochester, Minnesota, went home to heaven on Monday, August 6, 2012, at Rochester Methodist Hospital after a two year battle with Spindle Cell Sarcoma. Lorajean was born December 7, 1978 in Rochester to Allan and Jean Vrieze. She spent her childhood in Chatfield and Glenwood, Minnesota, before moving back to Rochester and graduating from Byron High School in 1997. After studying at RCTC she married Jeremiah Spencer on April 22, 2000, and they were later divorced in 2009. Their two daughters were the center of her world. With her leisure time, Lorajean loved performing in local theater productions, volunteering at the History Center of Olmsted County, teaching Sunday School, gardening, composting, genealogy, 4-H, and caring for her urban chickens. Lorajean enjoyed her colleagues and working at Mayo School of Health Sciences and Mayo Clinic for ten years. Lorajean will also be remembered for her inspiring, humorous, and frank blog entries through which she creatively traced her journey with cancer. Many have found perspective, faith, and wisdom as they shared in the comedy and tragedy of her story. Lorajean is survived by her two young daughters, Elizabeth and Leia Spencer; their father, Jeremiah Spencer; parents, Allan and Jean (Siegle) Vrieze; brother, Lance (Cassie Kennedy) Vrieze; sisters-in-law, Molly (Larry) Murphy, and Katy (John) Coleman; nieces and nephews, Amelia & Allana Vrieze; Ryan, Kari & Brody Murphy; & Xander Coleman. Also survived by Lorajean: Jeremiah's parents, Tim and JoAnn (Rapp) Spencer; his grandmother, Catherine (Powers) Spencer; uncles and aunts, Maxine (Vrieze) and Richard Fleck, Karen (Vrieze) and Jerry Hamm, Richard and Ruth (Paul) Vrieze, Betty (Siegle) Flaherty, and many beloved cousines. She was preceded in death by grandparents, Fay and Gertrude (Stoskopf) Vrieze, Fred and Elizabeth (Fiechtner) Siegle; uncles and aunts , Emil and Nettie (Siegle) Tahran, Bud and Peggy (Siegle) Flaherty, Chuck Flaherty, Harold and Clara (Siegle) Flaherty, and cousins, Ronald Hamm, Kay Nicholson, and Ron Flaherty. The funeral service was held at 10:00 a.m. on Saturday, August 11, 2012, at Evangel United Methodist Church with Rev. Jeff Utecht and Chaplain Warren Anderson officiating. A visitation was held on Friday. Lorajean bequeathed her body to Mayo Clinic's Department of Anatomy and will have a final resting place in the Cherry Grove Cemetery in Cherry Crose, Minnesota. Memorials are suggested to Heifer International, Evangel United Methodist Church, or Eagles Cancer Telethon.